Watch the film and sign the Petition! The legal architecture for torture was originally outlined and sanctioned in 2002 by a series of memos drafted by lawyers in the Department of Justice's Office of Legal Counsel. Were these lawyers simply giving the President their best legal advice? Or was their work part of a larger criminal conspiracy to distort the law and authorize torture? Alliance for Justice's latest documentary film, Tortured Law, premiered online this week. This short film examines the role lawyers played in authorizing torture under the Bush Administration. Read more on our Justice Watch blog. 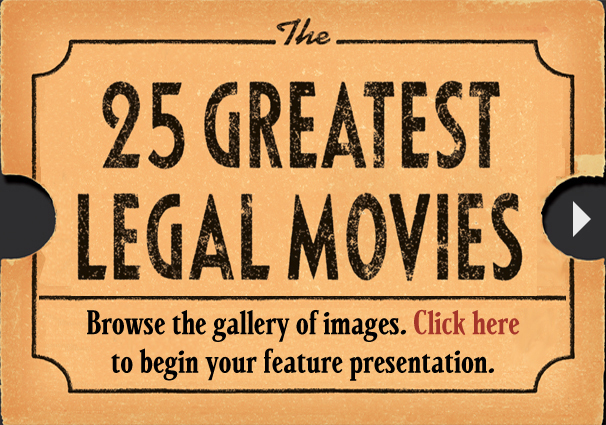 If you made a list of ten movies that law students "must see," which movies would be on that list? Make a few notes now and then see how your list compares to this one. What would Hollywood do without lawyers? In a town built on copyrights and cosmetic surgery, lawyers have done far more than pen the small print in studio contracts or post bail for hollow-eyed stars on the way to and from rehab. From the incisive Henry Drummond and the droll Mr. Lincoln to the callow Danny Kaffee and the regal Atticus Finch, lawyers have provided some of Hollywood’s most memorable cinematic heroes and some of its most honorable and thoughtful films.